Heritage is that important thing which is inherited and or can be passed on to future generations. It connects people with social values, religions, and cultures. It is that which existed in the past and still continue to have historical importance in the present. They include the history, traditions, or practices of a particular country. It includes a varied range of inherited traditions, monuments and culture. Civilization includes excavation, restoration and displays a collection of old things. India is a country which has a rich history and culture. Heritage is important for those buildings or structures that are of historical, aesthetic, architectural or cultural significance. It is an important part of the present that we live in and of the future that we will dwell on. It acquires its importance in the contemporary period. Built heritage represents the historical layers of our built environment in places made of brick, plaster, wood, metal, and stone. The Archaeological Survey of India is one of the oldest heritage bodies of India. Also Read: Contemporary Interior Design Style: A Guide to Decorate Your Home! The purpose is to formulate design processes that can assist and develop designers’ abilities to reconstruct and represent the heritage building’s interior within the historical context of sensitive conditions to its architecturally and historically significant features adopted with new activities. Heritage is divided into natural and cultural heritage. Natural heritage includes the countryside and the natural environment like sacred groves, hills, hillocks, water bodies (and the areas adjoining the same), open areas, wooded areas, etc. The cultural heritage plays a very important role in our lives which keeps us attached to our traditions. It provides a sense of unity and allows us to understand the previous generations and the history of where we came from. It is further sub-divided into tangible and intangible. Tangible cultural heritage is the one which has its physical presence like buildings, monuments, artifacts, landscapes, etc. while the intangible is the one which includes non-physical aspects of a particular culture like customs, dance, traditions, language, sports, etc. It is considered an important part of the culture. The UNESCO 1972 World Heritage Convention describes a cultural heritage, monuments, as group of buildings and sites of outstanding universal value, from the point of view of history, art or science, in the heritage architecture. Architectural heritage is a contributor to making heritage a popular culture. It is an innovative practice related to designing sustainable and affordable housing through different services. It deals with the adaptive re-use of historic buildings, which promotes a design philosophy supporting an integrated approach of revitalizing heritage values of a particular heritage building. How Architecture and Heritage (Construction) are Interlinked? Architecture is a part of the cultural tangible heritage. It is described as a reflection of any era or civilization. Through architectural style, the lifestyle, the culture, and the traditions can be easily known for any era. It provides a way to know about the physical attributes provided and maintained for the upcoming generations as a heritage. Heritage and architecture define the use of materials and technology. Also Read: Types of Materials that Can be Used in Masonry and its Specifications! What is a Heritage Home? A heritage home is publically acknowledging the property’s value to a community. It represents the vernacular buildings. The designation of such homes helps to ensure the conservation of the important places for the benefit of present and future generations. The heritage home has an aesthetically pleasing architecture. Heritage buildings depict the past history and culture of a nation. Heritage building means a building which has architectural, aesthetic, historic or cultural values which are declared as a heritage building by the heritage conservation or planning authority or any other authority in whose jurisdiction, such buildings are situated. They represent the architectural heritage of an area. The heritage buildings have beautiful architecture and correlation with important events that occurred in the heritage area such as religious, social and political events. Courtyards, patios, and verandas are common features of heritage buildings. Built heritage represents the historical layers of our built environment in places made of brick, plaster, wood, metal, and stone. They differ from modern buildings in the sense that they are anticipated to last permanently. Adaptive reuse of heritage buildings plays an important role in creating sustainable communities. It is a good way of bringing communities together. Heritage buildings add value to regeneration projects. The heritage places are good resources for the people of all the ages. The heritage home in old Ahmedabad in Gujarat is 200 years old. The building represents a typical Ahmedabad house with a central courtyard with the elegant façades. The structure is total of woodwork be it roofs, floors, walls, posts, etc. A small shaft is chiselled out from the rooms to improve the natural light and ventilation in the building. A part of the sloping roof is reconfigured into a terrace. It is famous for intricate carvings on pillars and ceilings. 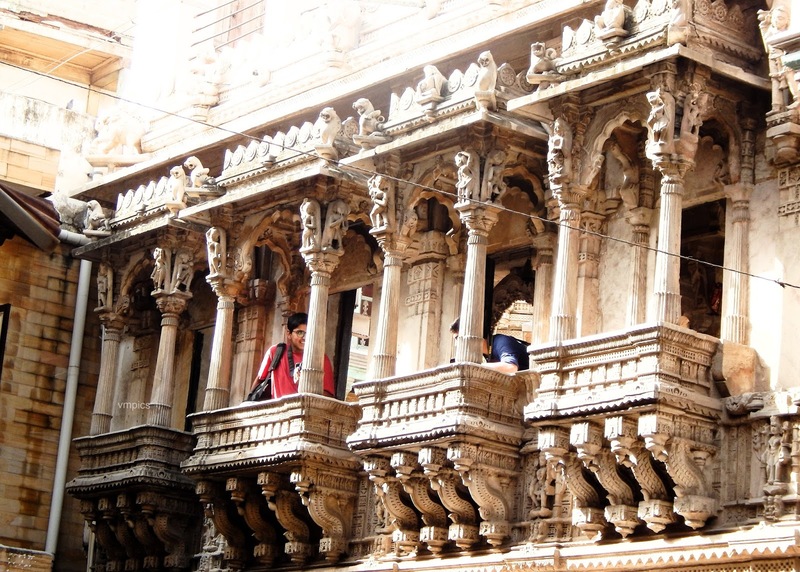 The architecture of this Haveli is such that it blends with the golden features of the city. With over 60 balconies and windows that allow air supply, it adds to the beauty of the Haveli. It is a 300 year old Haveli. This Haveli has a distinct architecture. This admirable mansion had a beautiful roof with carved brackets having the form inspired from peacocks. The walls, balconies all covered with imperial paintings. It is also called Jahaz Mahal due to its front façade resembling the ship’s stern. This building consists of 38 balconies which were designed completely different from each other. It is one of the major attractions of Jaisalmer. The palace is an excellent building of Indo-Saracenic tradition which is a mix of Indian, Islamic and European elements with the help of domes, minarets, and arches. 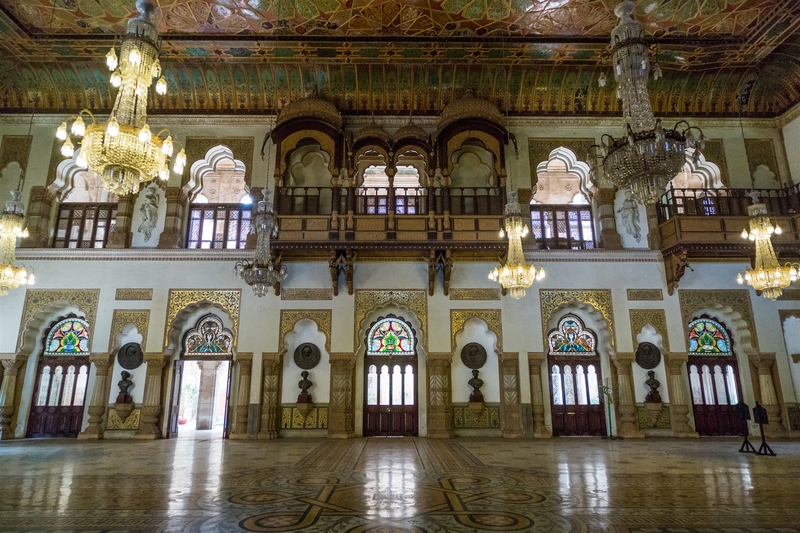 It was built by Maharaja Sayajirao Gaekwad II in 1890. The palace is still a residence for the royal lineage. It is considered to have the largest private dwelling being built to date. It is a magnificent piece of architecture. It is one of the majestic structures in India. The entrance adorned with an ornate fountain. The palace consists of beautiful artworks including sculptures, paintings and beautifully decorated walls and ceilings. The Tambekar Wada is a three-storied building which is a typical Maratha Mansion. It was once the residence of Bhau Tambekar. The Wada has of the most beautiful 19th century murals inside. The building is almost more than 140 years old. It is the wooden multi-storied townhouse. The mansion’s walls, ceilings, and doors are decorated with the best murals. The plan of the Wada is rectangular in shape. They contain more than 300 old paintings which are more than 100 years old. This is a courtyard type house where the central courtyard is an outdoor living space open to the sky. It is rectangular in structure, where the four halls are joined with the central courtyard. They also have large verandas supported by huge wooden pillars and cattle shed. The doors and windows are usually made of teak wood. Khajuraho is a unique heritage site that is famous for a group of Hindu and Jain Temples. It is famous for the magnificent human creativity on the sculptures carved on the sandstone walls. They are well known for the Nagara style symbolism. Hampi is an important UNESCO World Heritage site located in the Northern part of Karnataka. It depicts the fine Dravidian style of art and architecture. The architectural magnificence of monuments makes Hampi one of the most striking ruins of the modern world. The Sun Temple is a 13th-century temple in Konark, Orissa. This world heritage site reflects the traditional style of Kalinga Architecture. It is one of the finest examples of temple architecture revealed in its conception, scale, and proportion. It is widely known for the profusion of sculptural work. It depicts the grace, joy and the rhythm of life. The Sanchi Stupa is one of the oldest stone structures of India. It reflects the gem of Buddhist art and architecture. The magnificent relics dedicated to the Buddhist faith were rediscovered in the ruins but its glory still shines through. It was built in the Mauryan period by the emperor Ashok. It was enlisted as the UNESCO World Heritage site in 1989. Heritage is thus about the things from the past which are valued enough to save for tomorrow. This article thus describes the importance of heritage, how heritage and architecture are connected, what heritage home is, few examples of heritage homes, and describing the heritage sites in India. Next PostNext Patio Roof Materials: Know its Various Types & How to Choose?